This is my current piece in the Exposed! show at the Helen Day Art Center. It is my Beehive. In the last number of years I have been working with materials that are not biodegradable. My goal is to figure out how one can create art from these items that are not typically used and are commonly discarded without much thought. In the past I have created art using grocery bags. This year I decided to work with k-cups form Keurig machines. The cups reminded me of a beehive, it gave me the theme for the piece. Over a year I collected over, 350 k-cups, yes we drink a lot of coffee, and formed them into the inside structure of the beehive. The outside of the beehive is covered with expansion foam which was originally gray. You'll see it has taken on a yellow hue due to pollen and sun, as I had been storing the piece outside on and off while I worked on it. It will be interesting to observe it over the next few months, where it will live full-time outside, to see what the patina does. The artistic question is do I keep it true to the color of the beehive or allow the environment to effect the piece. Only time will tell. 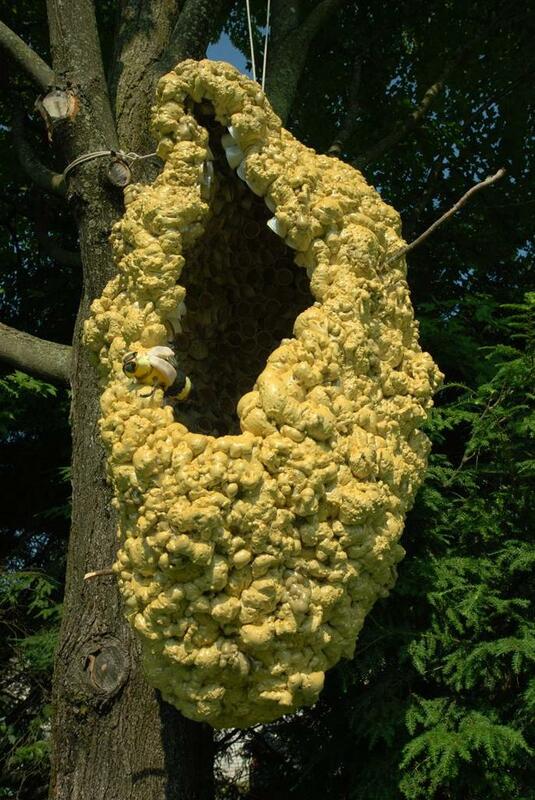 You can view my Beehive hanging near the Helen Day Art Center now through October. Join me and the other artists in the Exposed! show tonight for a walking tour of all the works. Click here for more information.